Lately I've been dying to introduce a purple smoky eye into my everyday makeup look since it's a bit more dramatic than wearing neutral browns but can still be appropriate for work if worn right. So I decided to splurge on the Dior 5-Couleurs quint in Stylish Move (970), which comes beautifully encased in a Dior compact with mirror and two applicators. You also get a velvet pouch to slip the palette into to keep it safe from scratches. Dior quints are great because they contain a set of expertly coordinated shades that can be worn multiple ways to create various looks. The package contains an insert that explains how you can mix trios (using the 3 colours across the diagonal of the palette) to create structured "couture looks", duos (by matching any two colours side by side), or solos (a single colour as eyeliner or a wash over the lid). I'm already envisioning the various combinations I'll be able to create and I can't wait to try them all! Stylish Move contains some gorgeous shades: a purply taupe, a light pink, a dusty mauve, a dark plum, and an opalescent sheen. The standout shade for me is definitely the dark plum, which can be built up for a super rich colour. I also like the opalescent sheen in the middle, which makes an excellent highlighter for the browbone and tear ducts. For the purposes of this review, I decided to throw a quick look together and must say, I was rather impressed with the application process. 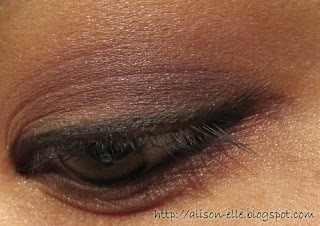 The shadows apply super smoothly, with the texture being more of a satin than frost. They blend quite well and have a good amount of pigmentation (although I always apply shadow over my Urban Decay Primer Potion for better staying power and bolder colour). Although Dior is expensive, I think it's worth it to treat yourself once in a while. I'm definitely looking forward to collecting a few more of these quints! Since my nails are a bit longer than usual, I decided to go for a more neutral look this time (I personally prefer bolder looks on short nails). I opted for OPI Tijuana Dance?, which is an cool-toned iridescent lilac-pink. The colour has just the right amount of pearlescence, and is neither glittery nor frosty. I actually hated this shade when I first bought it because I felt it was too sheer but after figuring out how to work with it, I've come to love Tijuana Dance? for the polished, manicured look it gives. In essence, it's "my nails but better"! Perfect for the office or even the base shade on a French manicure. The product is super sheer, so don't expect to see too much from the first or even second coats. The colour is buildable, however, and you can customize how sheer/semi-opaque you like it. I personally use 3-4 coats (outrageous, I know!) but if you paint on thin coats, the polish will dry relatively quickly. For May Long Weekend, my bf and I decided to go camping along the Oregon coast as neither of us have been there before. Plus I have been dying to try my hand at this "nature" business since anyone who knows me will probably tell you I'm the least outdoors-y person ever. The Oregon Coast Scenic Byway adds an extra 2 hours to the trip (versus taking the I-5) but it's totally worth it. We stopped in Cannon Beach, which is a cute like seaside town, and there are plenty of lookout points along the way. Our final destination was the Jessie M. Honeyman State Park, where I somehow miraculously survived two days in the "wilderness." Given the fact that my blog is mostly about makeup, I'm going to admit right now that I actually didn't wear makeup most of the time I was there (crazy, I know!) Not to mention the fact that all fashion rules got thrown out the window in order to stay warm. Perhaps you could call my look "hobo chic"? HAHA. Anyway, despite all the dirt and bugs, I still had a good time. I'd love to go back again and with only an 8-10 hour drive from Vancouver, it definitely makes for a quick and easy getaway. 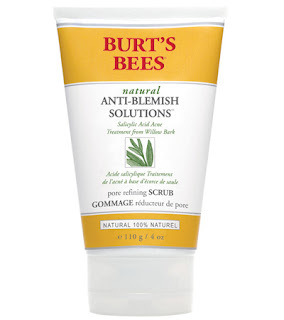 Burt's Bees has recently introduced its new Natural Anti-Blemish Solutions line, which includes a cleanser, scrub, spot treatment, and moisturizing lotion. In a world filled with numerous acne-fighting products from medications to those available over-the-counter, I must say that it's about time that someone came up with some truly natural acne reduction products! Thanks to PR, I was able to try out the new Pore Refining Scrub, which I easily inserted into my daily skincare routine. I don't actually have acne and my skin is generally breakout-free, but figured this product might be good to use for its pore-refining features. As with all Burt's Bees products, this scrub is made of 100% natural incredients. Salicylic acid, derived from Willow Bark Extract, is intended to reduce acne and prevent future breakouts. Jojoba beads and a natural Fruit Acid Complex provide gentle exfoliation. Bonus: the tube is recyclable and made with 34% post-consumer content. I love the creamy texture of this scrub and the beads weren't rough on my face at all. Definitely left my face feeling clean and refreshed. The only "negative" is the smell which I'm guessing can be attributed to the Willow Bark. It's not necessarily a bad smell per se, but it might be off-putting to some. Although I can't really speak to the scrub's acne-fighting abilities, my skin has remained breakout-free since I started using it. So maybe it works? Burt's Bees does claim that this product is clinically proven to help reduce acne after two weeks of use. So if you're looking for a new scrub, I do recommend this over much harsher ones like St. Ive's Apricot Scrub - especially if you have sensitive skin. Sunscreen is so so important to maintaining healthy skin - especially delicate facial skin. I've been on the hunt for a good face sunscreen for ages but haven't been satisfied with the pickings thus far. In fact, many products claiming to be "non-comodegenic" and "oil-free" have caused breakouts or resulted in greasy-looking skin. Yuck! Enter: Neutrogena Ultra Sheer Water Light Daily Face Sunscreen, a new product which was recently released in North America just in time for summer. (Note: it's called Ultra Sheer Liquid Sunblock in the US). The product is marketed as being waterproof, sweatproof, non-comodegenic, oil- and PABA-free. Unlike Neutrogena's other facial sunscreen, Dry Touch, Ultra Sheer is what the Japanese refer to as "milky" sunscreen (think Kanebo, Sofina, etc.) This means that the sunscreen has a super liquid-y consistency rather than a "creamy" consistency. It applies almost like water and spreads so evenly that you can't even feel it! Aesthetics-wise, the bottle is quite small (40 mL) and is perfect for throwing into your purse on-the-go. Once the cover is off, the bottle's top looks like an eye dropper and you can hear the bead inside that helps mix the liquid before application (you have to shake the bottle before use). It's important to note that a little bit goes a long way! There is also a light fragrance (typical of Neutrogena's other suncare products) which might bother some of those more sensitive to smell. For me, it's not too strong to be unbearable. I've been using this sunscreen over the past few weeks to properly test it out and so far, the results have been phenomenal! No greasy-looking skin and no breakouts! In fact, Ultra Sheer makes the perfect primer since it dries quickly with a more matte finish (Neutrogena's dry-touch technology). At only $16.99 from Shopper's Drug Mart (compared to pricier Japanese sunscreens), this product is definitely a must-have. Since the weather's been so nice, I've been in the mood for super bright colours. Enter Essie Pink Parka, which was (ironically?) released with Essie's Fall Cuddle With Colour collection. It's a highlighter-bright neon pink which I think screams "Summer" way more than Fall. However, I'm not snobby about seasonal nail colours... I wear whatever I feel like no matter what time of year they're intended for! Unfortunately, the application process was completely awful. I used 3 coats and it was still super streaky. The only positive is that because the polish is a neon, it dries extremely fast. The finish is matte, which seems somewhat incompatible with the streakiness. Top coat (I used Seche Vite, of course) definitely helps to create a more polished look and hide the streaks. Despite hating the application process, I will continue using this colour because there is no other like it. It's very unique and I love having "statement" nails. Since Dine Out Vancouver is ending soon, my bf and I decided we needed to take advantage of the deals before it's too late. This time, we decided on a dinner cruise. The regular cost of a dinner cruise is around $59 per person, so with the $38 Dine Out menu, you save quite a bit! I had the caesar salad, salmon, and chocolate cheesecake - yum! The staff were all super friendly, and service was good. But the best part of the whole experience were the views of the city. The boat had an outside upper deck which was a great place to relax and soak in the scenery, but bf and I were also lucky to get a table right beside the window too. It's a completely different perspective when you're out in the water and really makes you appreciate the local environment. After seeing all the gorgeous swatches of MAC Blue India from the Give Me Liberty of London collection, I knew this was a polish I needed to own. Unfortunately, by the time I managed to find the time to go out and look for it, it was sold out at most stores. I was lucky enough to grab the last two bottles (one for me and one for a friend) from the downtown MAC on Robson Street. First things first, the packaging is absolutely adorable. The box features a gorgeous print (I should have taken a picture but this is easily found on Google) and the bird on the bottle adds a little something extra. Plus I've always liked MAC's nail polish bottles with their sleek shape and "nubby" black tops (similar to NARS packaging if my descriptor makes no sense whatsoever). I've stayed away from MAC nail polishes in the past because I know a lot of people find their formulas unworkable. But Blue India is different. It's a cream formula and applied very easily! Only two coats to achieve opacity, but I applied a third one anyway. I think the best part about the polish, however, is the unique colour. It's a beautiful slate grey-blue which is perfect for more "moody" days. I've been on the hunt for a classic black leather bag for quite some time now. I needed something large (but not too large) and versatile enough to go with a wide variety of outfits. Plus, I prefer a bag where I have the option of wearing it on my shoulder or holding it in my hand. Sounds simple enough, right? I thought so too, but there are just so many choices out there! I had it narrowed down to a few (the Coach Brooke and Foley & Corinna City Tote among them) but finally decided on the ONE... the Marc by Marc Jacobs Classic Q Hillier Hobo! 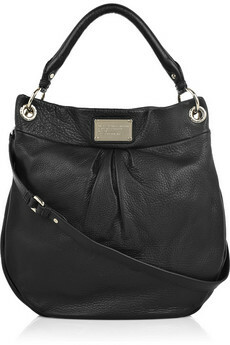 This gorgeous bag is now in my possession and I am madly in love (er... as much as one can be with an inanimate object). The leather is buttery soft, the print lining is gorgeous, and I love the hardware. It's tasteful without screaming "Look at me, I'm designer!"